28 July – A 28-year-old Melbourne man has been remanded in custody after being charged by the Melbourne Joint Counter Terrorism Team for attempting to travel to northern Iraq to fight with Kurdish forces against Islamic State. Jamie Williams, of Epping, in Melbourne’s northern suburbs, was arrested last night and made a brief appearance in the Melbourne Magistrates Court today. He was remanded in custody until his next court appearance in October and his lawyer Rob Stary said he would be applying for bail. Williams appeared calm in the dock during the short filing hearing, and was supported by his partner and mother. He was dressed in a black T-shirt and had a beard and a tattoo on his left arm. It will be alleged Williams “undertook preparations and attempted to depart Australia in December 2014”. He was detained at Melbourne Airport on December 28 last year. 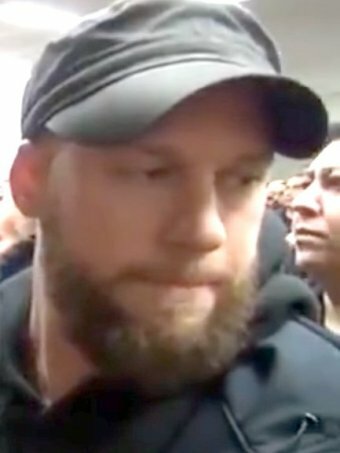 When asked what he was travelling for it is believed Williams admitted he was going to fight with the Kurdish forces, and planned to travel to the northern Iraqi city of Sulaymaniyah. Sulaymaniyah is a well-known entry point for Westerners wishing to join the fight against Islamic State. His passport was immediately seized. Members of the Customs service, now part of the Australian Border Force, identified him as a potential foreign fighter as he attempted to board a flight for Qatar. Various items of “military-style equipment and clothing” were allegedly found in his luggage. The Australian Federal Police (AFP) executed a warrant on Williams’ house in March and seized his mobile phone and a computer. The warrant allowed the police to seize anything relating to the Lions of Rojava and a woman named Kader Kadandir, who runs the Lions of Rojava Facebook page. The Lions of Rojava is a Facebook page of Kurdish sympathisers who use it to promote their cause and recruit Western fighters. AFP Assistant Commissioner for Counter Terrorism Neil Gaughan said regardless of who it was, undertaking a plan to travel to Syria or Iraq to support those involved in the conflict was “illegal and highly dangerous”. “While this individual did not actually travel, people need to be aware that actively planning and undertaking preparations to travel to the conflict area still constitutes a criminal offence,” he said in a statement. Williams has been charged with one count of preparing for incursions into foreign countries for the purpose of engaging in hostile activities. The maximum penalty for the offence is life in prison. The parents of Gold Coast man Reece Harding, who was recently killed fighting with the Kurdish YPG forces in June, want that to change. Keith Harding told the ABC’s 7:30 program that Australians who support the YPG should not be treated like those who fight for or support Islamic State. “We’ve got to change public opinion for these foreign fighters that are fighting against ISIS and allow them to come home safely,” he said. 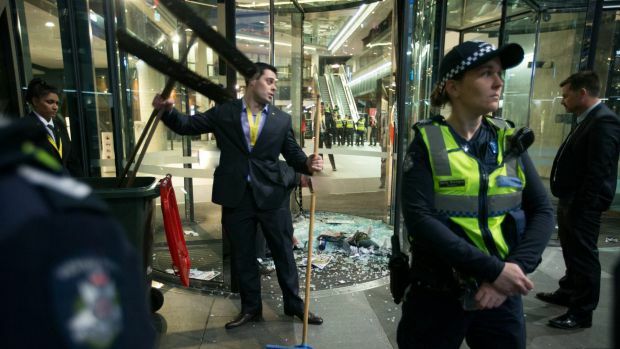 31 July – Student protesters smashed a glass door panel in an attempt to storm a building where federal Education Minister Christopher Pyne was launching his new book. They also blockaded the doors of the Docklands building, stopping some from entering the event, which was delayed for about 30 minutes until police regained control. A beatbox blared music throughout the scuffle as the group of about 100 demonstrators, who were protesting against cuts to higher education funding, chanted slogans such as “no ifs, no buts, no education cuts”. “I’d like to welcome those who made it through,” Mr Pyne told the audience on Friday night. “We’re about two-thirds the number that RSVP-ed, so sadly I think about a third of the people who wanted to come couldn’t get through. The National Union of Students organised the protest to express its opposition to the deregulation of university fees. Members shouted “No cuts, no fees, no corporate universities” and jostled with police. One female protester was arrested and charged with assaulting police, while three police officers were treated for minor injuries. Victorian Liberal Party president Michael Kroger launched Mr Pyne’s book, A Letter to My Children, as Prime Minister Tony Abbott had to pull out.